Having worked on the issue of Israel and its myriad conflicts for many years, one gets used to tragedy and even to stunningly abhorrent behavior. And indeed, I have seen more than enough of both from all sides in this conflict. But every once in a while, things take a turn, and that turn is punctuated by a singular, stunning event. 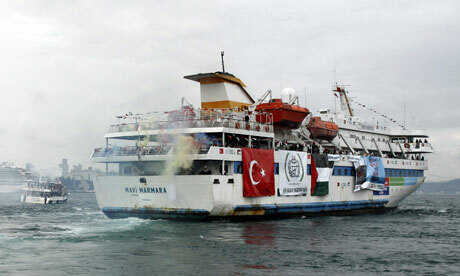 The murderous raid on the Gaza Freedom Flotilla this day was one such event. During the intercept of the ships, the demonstrators onboard attacked the IDF Naval personnel with live fire and light weaponry including knives and clubs. Additionally one of the weapons used was grabbed from an IDF soldier. The demonstrators had clearly prepared their weapons in advance for this specific purpose. As a result of this life-threatening and violent activity, naval forces employed riot dispersal means, including live fire. Reports from IDF forces on the scene are that it seems as if part of the participants onboard the ships were planning to lynch the forces. I am sure, as is always the case, there will be those who believe this version of events. But frankly, I can’t see how anyone can do so unless they are so desperate to justify Israel’s action here that they’ll believe anything. Let’s examine the IDF’s version of events. Several readers asked why I left Zeek Magazine. In general, this is the sort of thing I’m loathe to write about. However, since the Tikkun Olam blog posted an article about the goings on at Zeek, I thought I should say just a few words, even though the article only barely mentions my departure. As I told Richard Silverstein, the author of the piece in question, my departure from Zeek was entirely my own decision. I was neither let go nor was I in any way pressured to leave. In fact, I declined a request to continue there on a monthly basis, but with a mutual agreement that I might submit articles there on an ad hoc basis in the future. The parting was totally amicable. Like Silverstein, I was dismayed to say the least that The Forward decided to publish an op-ed piece by John Hagee, giving him an opportunity to cover activities which are detrimental to a peaceful resolution to the Israel-Palestine conflict with friendly words to Jews which I believe were disingenuous. But this had nothing to do with my departure. I also have nothing to add to the issues Silverstein raises regarding Rachel Tabachnik and her departure from Zeek. Both sides in that argument have presented their views and will, I’m sure, continue to do so. As I was not privy to any of the internal discussions involved there between Rachel and Jo Ellen Kaiser at Zeek, I have nothing to offer on either side. I can only say that I hope these things do not escalate as, at the end of the day, we all have the same ultimate goals and we only help the conservative forces in our community when we fight among ourselves. As Silverstein mentioned, Zeek editor Joel Schalit departed Zeek last week. Joel was the person who brought me into Zeek and has been working closely with me as my editor for years, long before we both came to Zeek. I expect that Joel and I will continue to pursue mutual projects. Due to other personal changes that I am working with at this time, Joel’s departure seemed a good time for me to leave as well. That was all there was to it. In no way did anyone at Forward or Zeek encourage my departure, but to the contrary, asked me not to. I did not leave in protest or under pressure. I hope that Zeek will continue to produce its unique material, I wish Jo Ellen and everyone there only the best, and I hope we will work together again in the future. I had been wondering only recently when Israel would bar the entry of Noam Chomsky. That time has come today. About two years ago, I recall that the controversial scholar Norman Finkelstein had been detained at Ben Gurion Airport and eventually deported. I got some heat for not wanting to raise that as an issue for Americans and American Jews. My reasoning was that a country has the right to restrict who may enter its territory. In a democratic society, we expect that the country in question hold very stringent standards for who it might bar, and that the null assumption is that a visitor with a valid passport may enter. In Finkelstein’s case, he had, not long before, appeared publicly in strong support of Hezbollah. Did that make him a security threat? No one in their right mind believed that, but, in my view, it gave Israel enough of an excuse to bar him from entry that I felt the issue was one that should be taken up by Israelis and Palestinians, not Americans. In reality, of course, Finkelstein was not being barred because anyone believed him a security risk, but because of his political views and scholarship. But he also acted in a way that gave Israel an excuse to do what it did. Ameer Makhoul, a Palestinian Israeli citizen who lives in Haifa has been arrested and a gag order has been placed over the case, demonstrating that the embarrassing Anat Kamm affair taught Israel nothing. I wrote about this and the implications for Israeli democracy for Zeek Magazine.